A good example came up just the other day. Someone had asked for people’s experiences using fuelling when running marathons, and lots of people chimed in. If you were a new marathoner and hadn’t contributed, you wouldn’t get notifications of new posts. But by saving the post, you could return to it to see what information the experienced runners had shared. I’m sure you can think of lots of reasons why you might want to save a post, from saving photos of someone’s wedding to a link to a dog you’d like to adopt that you want to share with someone else later. Here’s how you do it. How do I save a post on Facebook? Note that this arrow (or chevron) will take the form of an ellipsis (…) on your mobile device. This also gives you a quick route to see your saved items. How do I stop saving a post on Facebook? If you click this, just this post will disappear from your saved posts list. How do I find my saved Facebook posts? 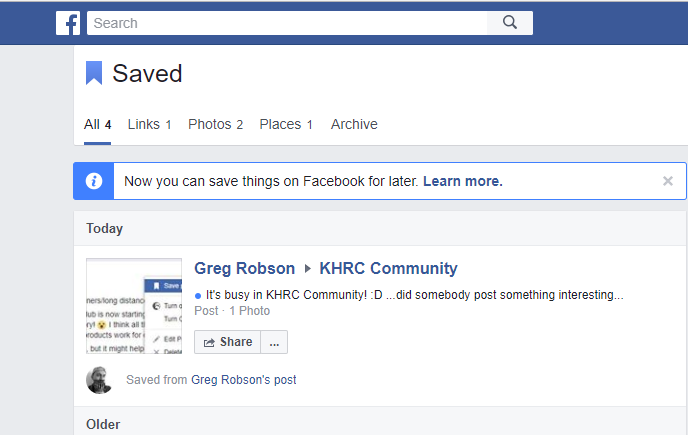 This article has shared how to save a Facebook post, as well as how to un-save it and how to view your saved Facebook posts. If you have found this interesting and useful, please do share it using the buttons below, or leave a comment. You’re welcome – glad I can help! Here’s a very helpful post from the Libro Editing blog on how to save Facebook posts. You’re welcome – I aim to help! Thank you for this – reblogged on http://www.believinginhorses.com/blog!